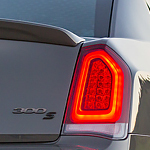 As full-size luxury sedans go, the Chrysler 300 has long been one of the best on the market. Between carefully chosen design features and high-performance output, consumers keep coming back year after year to see what the Chrysler team has come up with next. That is why we here at West Covina Chrysler Dodge Jeep Ram is so excited to announce the arrival of the all-new 2019 model! The electric power steering of this sedan make it highly responsive to even the smallest amount of feedback from the driver. This will allow you to easily maneuver through traffic in even poor weather conditions. Additionally, the all-wheel drive system in this vehicle make its handling one of the best in its class. In regards to power, the available 5.7 liter V8 engine is capable of putting out a highly impressive 363 horsepower and 394 lb.-ft. of torque both of which earn the title of best in class.